Pro Football Focus’ ‘Snaps Lost’ series takes a detailed look at playing time void, created by players who have left their respective team either during the season last year, or during this past offseason, albeit trades, cuts, signing elsewhere or retirement. 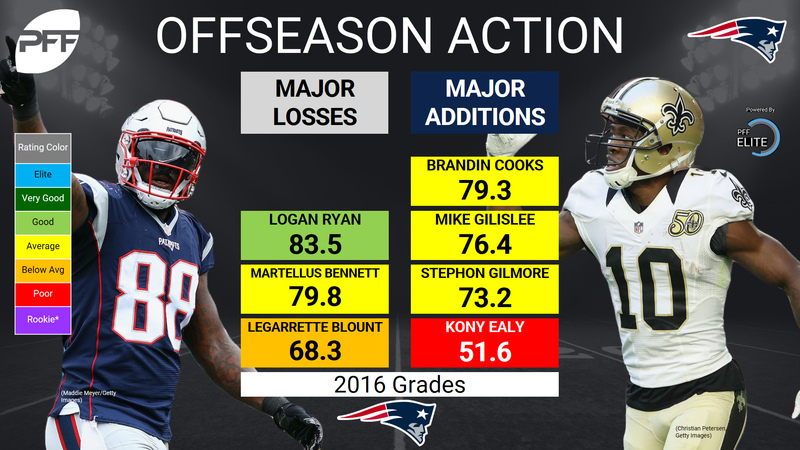 Sign up for PFF Edge for full player grades heading into the 2017 season. The Patriots made a huge splash in free agency with the signing of Stephon Gilmore. He is a shoe-in replacement for former starter Logan Ryan, who left in free agency to sign with the Titans. Ryan was the second-most targeted player in coverage in 2016, while Gilmore was targeted just once per every 7.9 snaps in coverage, fifth lowest (min. 300 snaps in coverage), giving up just a 70.6 passer rating against. Teams will now be forced to filter some of those targets Gilmore’s way, which should result in more big plays for the Patriots, as Gilmore ranked 10th among all cornerbacks in 2016 with a Playmaker Index of 16.2 percent (min. 500 snaps). While serving as the main starter opposite Malcolm Butler in 2016, Ryan was also the teams main slot defender, dropping back 309 times in slot coverage last season. Jonathan Jones, Justin Coleman and Cyrus Jones appear to be in competition to pick up some of those slot coverage snaps for 2017. Coleman, the most experienced of the three, gave up just two receptions on nine targets in the slot, for a 39.6 passer rating in 2016. Technically Rob Gronkowski is not a new addition, but he was lost for the year after only playing eight games last season. Martellus Bennett filled the “Gronk” role admirably in his absence, allowing the Patriots to survive and win a title without Gronk for the first time since 2004. The return of a healthy Gronkowski would mean the return of the player who gained the most yards per route run among all pass catchers of any position, at 3.18 YPRR. Dwayne Allen was an addition this offseason by way of trade from the Colts, billed as a versatile player who figures to see a significant amount of snaps in the second tight end role behind Rob Gronkowski. In 2016, Allen racked up 1.72 yards per route run from the slot, ranking 11th out of 32 tight ends. Though on his 53 snaps in pass protection, he allowed nine total pressures for an 85.8 pass block efficiency rating, ranking last out of 46 tight ends. The edge position for the Patriots was the position hit hardest with loss in the offseason, and it remains a question mark how exactly the Patriots will fill the lost snaps from the departures of Chris Long, Jabaal Sheard and Rob Ninkovich. It will likely be a some sort of combination newcomers playing in a rotation, but Kony Ealy looks like the top choice to pick up a majority of snaps, as a veteran arriving via trade from the Panthers. The Patriots will be hoping a change of scenery will provide a spark for Ealy’s play, as he had a pass rush productivity of just 6.7 in 2016, ranking 39th of 53 4-3 defensive ends. The Patriots also addressed the edge spot in the draft, using two of their four picks on the position on Derek Rivers and Deatrich Wise, who figure to factor into the rotation immediately. Rivers is a small school product with outstanding upside but will likely need to be eased in and developed. Wise played fewer than 500 snaps in each of his final two years at Arkansas succeeding Trey Flowers, but racked up a combined 82 pressures and 55 stops during that span. Stephon Gilmore chased the big money deal in free agency, leaving the Bills with a vacancy at a starting cornerback position. The most likely to fill this void is Tre’Davious White, who was the Bills first round pick in the 2017 draft. White was the second-ranked cornerback on PFF’s 2017 draft board heading into the draft, and 12th ranked prospect overall. In his final at LSU, White allowed a 61.0 passer rating, and had an 89.9 overall grade. Shareece Wright and Leonard Johnson, two arrivals via free agency who graded poorly in 2016, should both compete for snaps in the Bills secondary as well. Wright allowed a passer rating of 115.2 (13th worst in NFL), while giving up six touchdowns vs zero interceptions. In 2016, only Johnson and Aqib Talib did not allow a touchdown while playing at least 300 snaps in coverage. 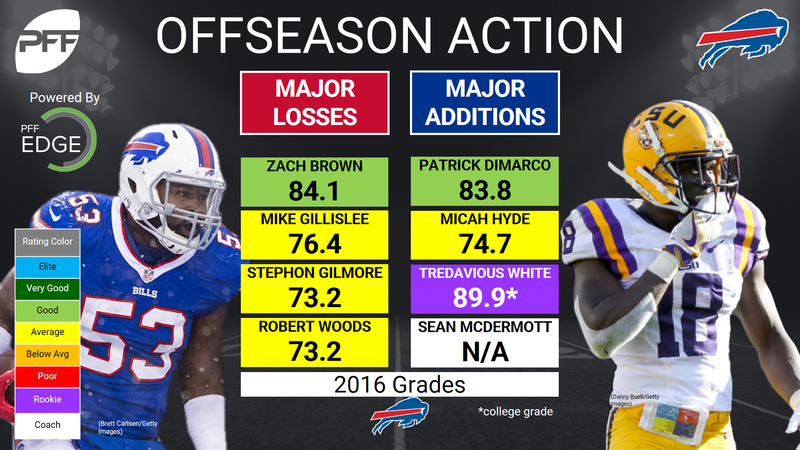 Reggie Ragland missed his entire rookie 2016 season due to injury, but the former second round pick projects to be a big part of the Bills plan for linebacker playing time in 2017. Ragland finished 2015 at Alabama graded as the seventh best off the ball linebacker in FBS with a grade of 87.8, while showing versatility to play versus the run, in coverage and rushing the passer. Gerald Hodges was the 49ers best linebacker last season, and figures to plan a significant amount of snaps for the Bills in 2017 as well. His 82.3 overall grade in 2016 was 20th best at the position, and his 29 run stops was 15th most among inside linebackers. The favorite to land a starting WR spot opposite Sammy Watkins is second round pick Zay Jones. Jones led college football in 2016 with 216 targets, yet despite the extreme volume he managed to be efficient averaging 2.96 yards per route run. Jones was PFF’s fifth ranked wide receiver prospect in the 2017 NFL draft, finishing wiht an 87.8 overall grade. Andre Holmes and Corey Brown figure to battle for the second starting receiver spot in the lineup as well. Holmes saw just 23 targets in 2016 with the Raiders, but caught 14 of those including three touchdowns for a 115.2 passer rating when targeted. While Corey Brown earned a passer rating of just 76.2 in 2016 when targeted, that mark was 125.0 in 2015, sixth best among all wide receivers (min. 45 targets). For more signature stats like WR Rating, Yards Per Route Run and much more, sign up for PFF Elite now. Nate Allen is projected to fill in the starter role left by the release of Abdul-Quddus due to an unfortunate neck injury. In 2016, Allen made seven run stops, tied for most among Raiders safeties. While Allen’s career-high grade of 81.0 came in 2014, the past two seasons have seen him in a reduced role and in 2016, he earned a 52.1 overall grade. Former Ram T.J. McDonald is suspended for the first eight games of 2017, but should compete with Allen for playing time once he returns to the Dolphins active roster. In 2016, McDonald earned a coverage grade of 81.8, 23rd best among safeties. His run defense grade of 41.3 however was 83rd out of 88. When healthy, Julius Thomas is a highly effective tight end as shown by his 2013 (82.5 overall grade) and 2014 seasons (79.8 overall grade). His last two seasons have been injury-riddled however, and his 2016 season ended with him earning an overall grade of 58.5. In 2013, Thomas averaged 1.81 yards per route run, eighth best for his position, yet last season dipped all the way to 0.95 YPRR, ranking 37-of-40 tight ends. Anthony Fasano is another new tight end to this Dolphins roster who should see plenty of action, yet his impact will mostly be felt as a blocker. In 2016, Fasano earned a run block grade of 89.7, best of all tight ends. 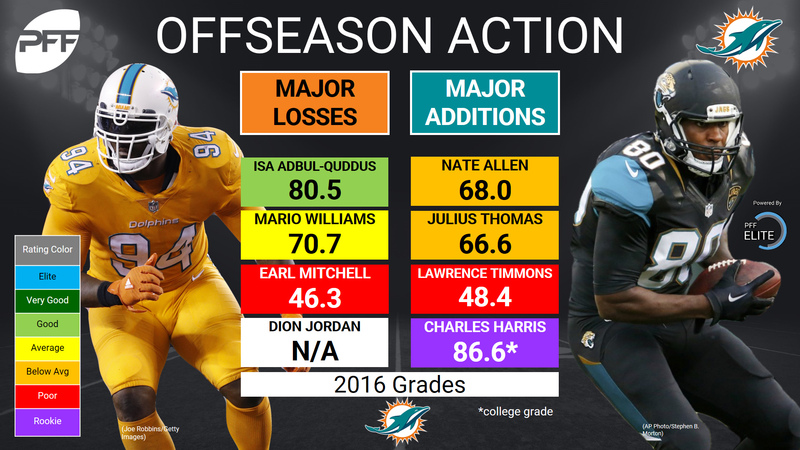 Longtime starter for the Steelers and now free agent arrival Lawrene Timmons figures to provide a stabilizing presence for the Dolphins linebacker core in 2017, who saw a revolving door in the lineup aside Kiko Alonso throughout the 2016 season. In 2016, Timmons made 28 run stops, T-17th most among inside linebackers, and made 17 stops in the passing game, T-13th. The Dolphins used a second round pick on McMillan, who racked up 138 stops in his three seasons at Ohio State and was PFF’s fourth ranked linebacker prospect heading into the 2017 NFL draft. McMillan seems to be pushing for playing time as he is already seeing first-team reps at middle linebacker in training camp. The Jets signed Morris Claiborne to replace Darrelle Revis as their top corner after having a career high overall PFF grade of 84.0 (13th of 110 ranked cornerback) last season in Dallas. Last year, Claiborne finally showed off some of the skills which made him the sixth overall draft pick in 2012, allowing a passer rating just 64.1 in his coverage, eighth best of all cornerbacks. His 0.81 yards allowed per cover snap were ninth best of all cornerbacks. Despite seeing 872 snaps last season, Quincy Enunwa figures to see an even larger role in 2017 following the departure of Brandon Marshall. Enunwa was the Jets best wide receiver in 2016 earning a grade of 75.4, which ranked 53 out of 115 wide receivers. Enunwa was impressive on deep balls catching 8 of 8 catchable targets, posting a deep ball catch % of 80.0, best mark in the NFL. Though he will need to improve his concentration as his 12 drops were 2nd-most of all receivers. Robby Anderson should be next on the depth chart after Enunwa and thus should see an increased role in 2017 after showing some flashes last year. The speedy Anderson saw a deep target percentage of 37.3, second only to Sammie Coates, catching 9-of-9 catchable deep balls. If Anderson’s offseason legal troubles lead to a suspension, this would open the door for third round pick Ardarius Stewart, PFF’s 14th ranked wide receiver prospect in the 2017 NFL draft. 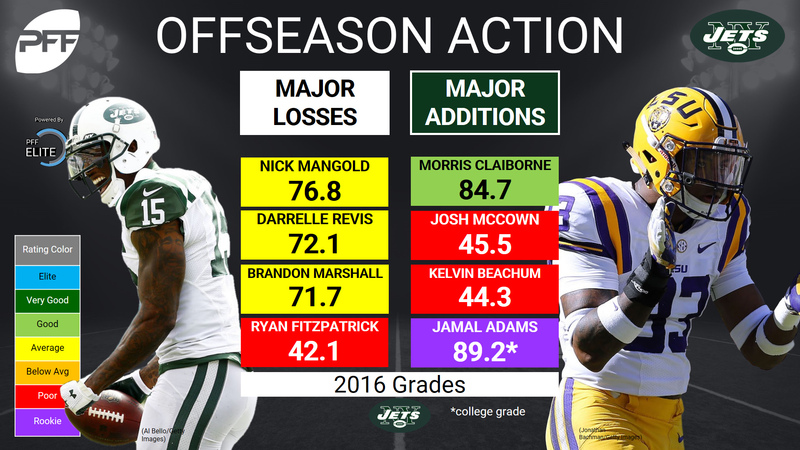 Despite finishing 2016 as the Jets top graded linebacker, the team decided to continue the youth movement with the release of veteran David Harris. In his place, second-year player Darron Lee takes over, looking to improve upon a rookie season which saw him struggle to a 36.2 overall season grade. In 2016, Lee posted a run stop percentage of 5.7, which ranked 54th-of-60 inside linebackers. In coverage, Lee was just as inefficient, earning a cover snap per reception rate of 7.2, 54th best out of 57 inside linebackers. One area Lee was above average was tackling efficiency, missing just three tackles and earning a tackle efficiency of 15.3 on the season, 15th best out of 64 inside linebackers. The Jets brought back Demario Davis, originally a third round pick by the team in 2012, to start opposite Darron Lee. Davis also struggled in 2016 with the Browns, earning a 47.1 overall grade, ranking 63rd-of-86 at the position. His strength was in coverage, allowing just 0.72 yards per cover snap, eighth best of inside linebackers.